This is a deluxe version of K&H's popular Deluxe Ortho Sleeper. "Made with soft, velvety, printed Microsuede. 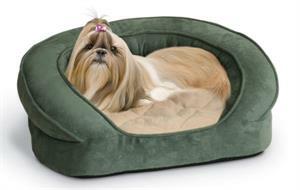 The sleeping surface is covered with ultra soft quilted fleece on top of 3” of orthopedic foam. Adding the ever popular bolster, makes this bed a no-brainer. Sleeping Dimensions: 26"" x 27""
Dimensions: 40"" x 33"" x 9.5""
This is a sleeper bed that a pet of any age will enjoy.